Australia's Classification Board will not allow the sale of the crime simulating MMO, CrimeCraft, for rewarding drug use with in-game benefits. Late last week, the board ruled that the online shooter could not be sold in the country because of "boosts" in the game which mimic real world drugs. "In the board's opinion, there is insufficient delineation between the 'fictional drugs' available in game and real-world proscribed drugs," the report stated. There is no indication whether Vogster Entertainment, makers of CrimeCraft, will be releasing a version without the drug-use. Boost parallels the names, chemical elements, administration, treatment and addictive elements of real-world proscribed drugs, and when used provide quantifiable benefits to a player's character. The game therefore contains drug use related to incentives or rewards and should be refused classification. In addition, the names of boosts mimic the chemicals and colloquial names of proscribed drugs. Examples include K-Dust, Birth, Chimera, Majoun, Betadyne ResistX and Zymek Stim-Ex, as well as the anabolics Raze and Frenzy. The relationship between the Australian government and the games industry has been strained of late, with Attorney-General Michael Atkinson speaking out about Modern Warfare 2 and the banning of the initial versions of Left 4 Dead 2 and Fallout 3. So far, game companies have attempted to pacify the board with censored versions of their games. Valve released a less-violent LFD2 in early November and Bethesda created a Fallout 3 in which drug-use was less prominent for the Australian market. 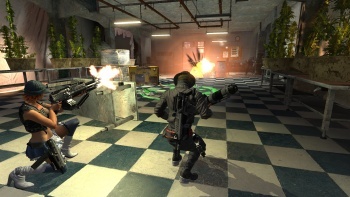 It is unclear if Vogster is willing or able to operate two different versions of CrimeCraft, as it is a persistent multiplayer world. I'm not sure I agree with game companies accepting this kind of censorship. It is a slippery slope.